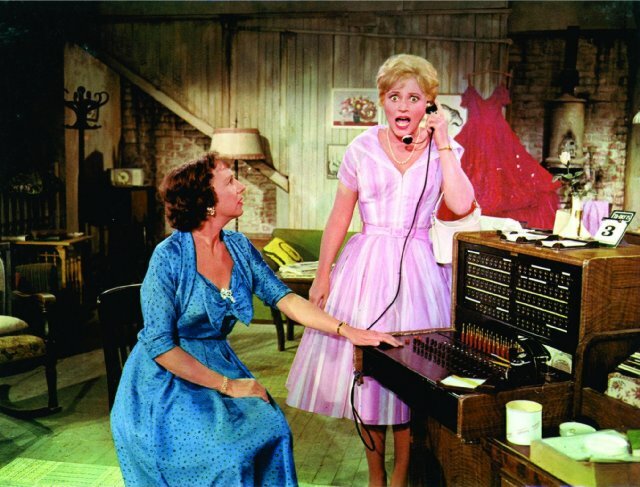 The unique, gifted and lovable Judy Holliday starred in two big Broadway hits. Fortunately, Hollywood let her recreate her roles in the movie versions. The first was a comedy. George Cukor directed Holliday to Best Actress of 1950 Academy Award victory for her portrayal of Billie Dawn, the dumb blonde who gets smart and makes her own Declaration of Independence from a tyrannical boyfriend in Born Yesterday. For Vincente Minnelli, the star recreated her role as the love-struck answering service operator in MGM's 1960 screen adaptation of the musical comedy, Bells Are Ringing. In that Broadway hit, Judy Holliday introduced two songs that are now standards -- "Just In Time" and "The Party's Over." Here's Holliday with another member of the original Broadway cast who got to do the movie version -- Jean Stapleton, a good ten years before finding TV fame as Edith Bunker on the classic sitcom, All in the Family. 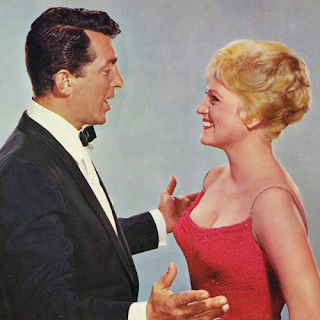 Minnelli called Dean Martin to join Judy as the guy who finds true love over the phone. A couple of months ago, I was in San Francisco for a few days freelance TV work. While there, I got to attend a local school's fine arts event one evening with my longtime dear and talented friend, singer Paula West. She was performing in this short program and she was the only grown-up. A group of middle schoolers was doing selections from Bells Are Ringing for parents, teachers and others. A wine and cheese reception preceded the 15-minute presentation. Paula sang "The Party's Over." The short program was so delightful and entertaining that I clapped as if I was one of the parents. The kids were priceless. They did a little dialogue and some pantomime. One of the most golden moments of it was the open. 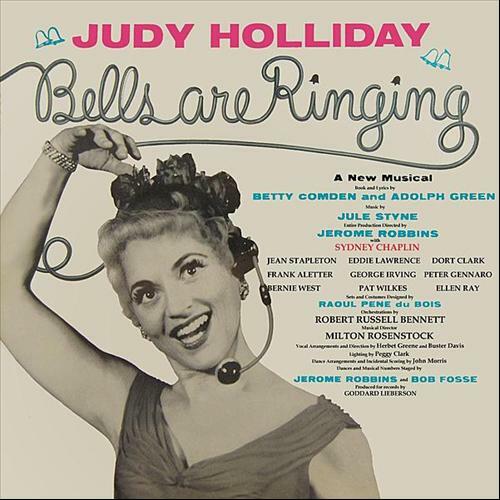 I listened to the original Bells Are Ringing cast album many times. I've seen the movie many times on TV over the years. But hearing the title song done by children was like hearing it for the first time. Their voices gave that waltz a new shimmer, a new lilt. Judy Holliday along with songwriters Betty Comden and Adolph Green must have been looking down from Heaven and smiling at what they heard. Here's the number from the Vincente Minnelli movie version. During the program, I stood next to the parents of one of the little boys in the show. My joy was obvious and we chatted about how much I loved the performance. I was so glad Paula invited me along with her. 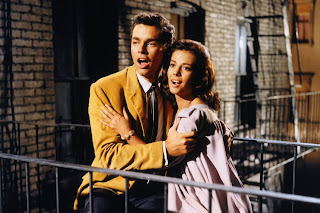 If you read my post from early this month about Shirley MacLaine, the same couple I talked about classic films with is the same couple whose kid was in the show. The children used props in the program. The married couple had watched their son in some of the early rehearsals. The wife said that the kids were all so dedicated. There was only one glitch. They did not know how to use the rotary telephones. The wife said that the kids kept poking their fingers into the holes and pressing the numbers. The teachers had to instruct them to keep their fingers in the little holes and turn that circular thing clockwise. Yes, it's a new age...and a new generation...with new technology. But those old Broadway hit tunes not only held up, they seemed new again when performed by a chorus of children. That presentation was like a Judy Holliday gift. 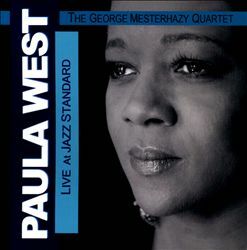 One more thing -- if you'd like to hear my friend, Paula West, look for her CD entitled Paula West, Live at Jazz Standard. With the George Mesterhazy Quartet, she performs "My Romance," "Pocketful of Miracles," "Wichita Lineman" and gives jazz interpretations to Bob Dylan's "Like A Rolling Stone" and "Don't Think Twice." To name a few. Treat yourself. George Mesterhazy played piano. Like Judy Holliday, he was a highly-regarded and unique artist who left us way too soon. The pianist/arranger passed away last April at age 58. The San Francisco Chronicle called his arrangements for Paula "exquisite."